Johnny Mercer was going for a rhyme. 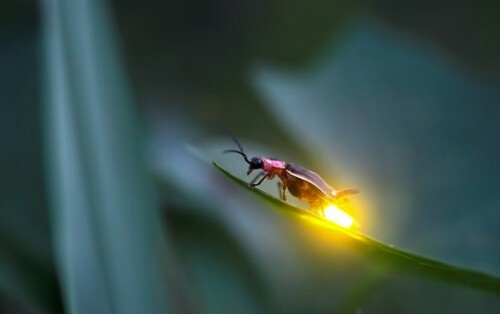 Little did he know that that lyric, which he wrote around 1952, would presage an environmental phenomenon to occur six decades in the future: the vanishing firefly. We became aware of this on a recent night when we were sitting on our backyard deck after dark, admiring the moon—a natural wonder that has suffered relatively little, so far, from human activity. There is a swath of lawn maybe thirty feet wide between the deck and a thick patch of woods; when we first moved here about 14 years ago, fireflies would flit around in that space on summer nights. As I sat there the other night, I remarked that I hadn’t seen a single firefly this summer. A little research on the iPhone turned up the fact that the firefly population all over the world has been sharply diminished. Those with knowledge of the subject speculate that the factors in this melancholy situation are overdevelopment, which destroys the firefly’s habitat and natural prey; artificial light, which interferes with the mating rituals of fireflies—that’s what those little flashes are all about; and pesticides. There are some places in the world in which fireflies are so numerous—or have been until now—that they constitute a tourist attraction. I also read about one river in Asia on which they are considered an aid to navigation as their thousands of winking lights along the shore outline the course of the water on dark nights. And, of course, fireflies have been among the charms in the lives of uncounted children. The firefly was an inspiration to the prominent German composer Paul Lincke, who included a song called “Das Glühwürmchen”—”The Glow Worm”—in his 1902 operetta “Lysistrata.” A lyricist named Lilla Cayley Robinson translated that song into English, and it was used in the 1907 Broadway musical “The Girl Behind the Counter.” But its permanent place in the popular songbook wasn’t sealed until Mercer got a hold of it and put his own spin on it for the Mills Brothers, who recorded it in 1952 as “Glow, Little Glow Worm.” It was the number-one song in the country for three weeks that year, and it was on the charts for twenty-one weeks. Whoever thought that song might be all we’d have left. You can see and hear the Mills Brothers sing this song on the “Nat King Cole Show” by clicking The Mills Brothers sing “Glow Worm” . They’re wonderful creatures, aren’t they? The good news is that there are places in Texas where they’re thriving, and seem to be increasing. Getting out of drought certainly helped. But there are problems, Do you know about the Boston Museum citizen-science project called Firefly Watch? I was put onto it about three years ago, and have participated. You might enjoy it, too. What’s not to like about doing science from the comfort of your back yard?